When choosing spiral router bits always remember that up cut spirals direct shear towards the router and down cut spirals direct shear away from the router. Up cut therefore favours the face of the work piece facing away from the router and down cut favours the face of the work piece facing the router. Chip clearance follows in the same direction as shear. Whiteside solid carbide flush trim spirals offer state-of-the-art results in flush trimming. The 6.35mm (1/4”) diameter bits are great for small inside corners. Try the Whiteside 3.18mm (1/8”) diameter bits for extremely sharp corners - guided by a solid pilot; all other spiral flush trim bits feature a double ball bearing guide. These spirals can be used on plywood, MDF, particle board, laminates, soft wood, hard wood and can also be used on insulation sheeting. Available in your choice of up cut, down cut and up/down combination (2+2 compression flush trim). Compatible with hand held and table mounted routers. Whiteside also make compatible bits for many different jig systems like Leigh Jig, Keller, OmniJig, Porta-Cable and what’s more Whiteside are Akeda approved and also the recommended bits for Incra. 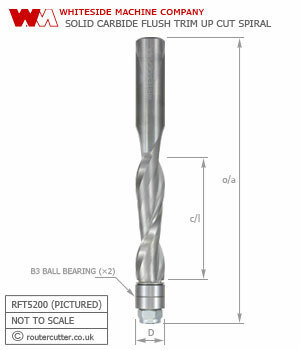 Please Note: We recommend that the RFT2100 and RFTD2100 be used to trim no more than 3.18mm wide × 6.35mm deep (1/8" × 1/4") due to the very fine diameter ball bearings. Heavier trimming can be accomplished by pre-trimming to 3.18mm wide × 6.35mm deep; using the modified 2100's which are factory installed with heavier bearings. The RFT2100MOD and the RFTD2100MOD are custom tools modified by Whiteside Machine Company.